Home » Blog » How to Buy a Radio Plan and Where is my Streaming Login? How to create my own radio station in Internet Radio Cast on VPS? To create your own radio station in Internet Radio Cast on VPS, you have to buy or subscribe a radio plan. You don’t have to create an account prior to buying a plan. It is very easy and direct, just follow these simple steps. All the plans are clearly seen in the homepage and Radio plans menu. 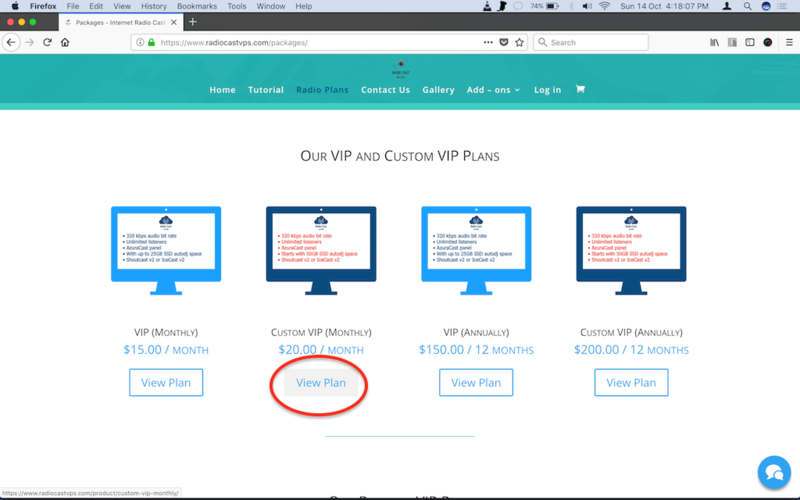 Choose view plans to view specific product and you will be directed to their single product page. 1 – First, under Data Center | Server location dropdown menu, you have 3 options to choose from… *Asia, America and Europe. *In the future, we are planning to provide server location in countries such as Australia and New Zealand. 2 – Secondly, choose what type of broadcasting service do you want us to install in your server. Either Shoutcast v2 or Icecast v2. 3 – ***Additionally, if you have a domain name already hosted somewhere else. You can further instruct us to create a server that is under your domain name as a sub domain. For example, you have domainname.com, we can create a server that is sub.domainname.com. Whatever sub domain you want it to be. And because of this, your free web player will automatically become a **white labelled player. ** For this feature, white labelled web player and server, we require a one time payment of $20. This feature request may be created and paid after the server is functional. *** This is not a required step. 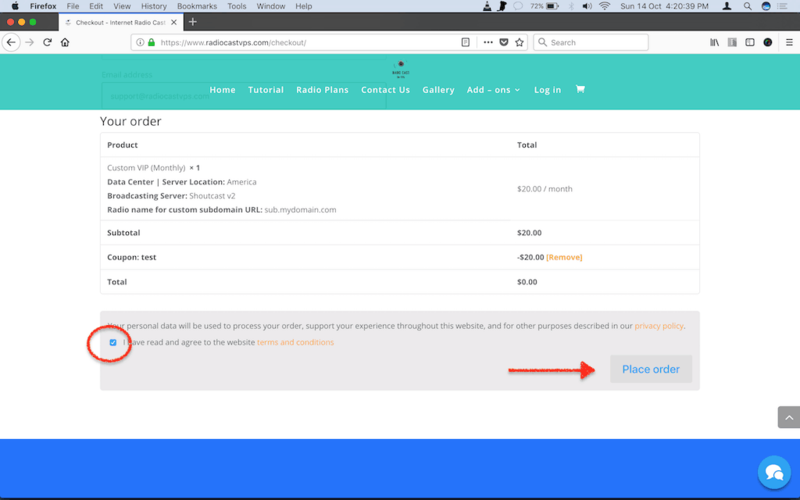 If you don’t want this feature, you can just leave it blank and proceed to add to cart button. 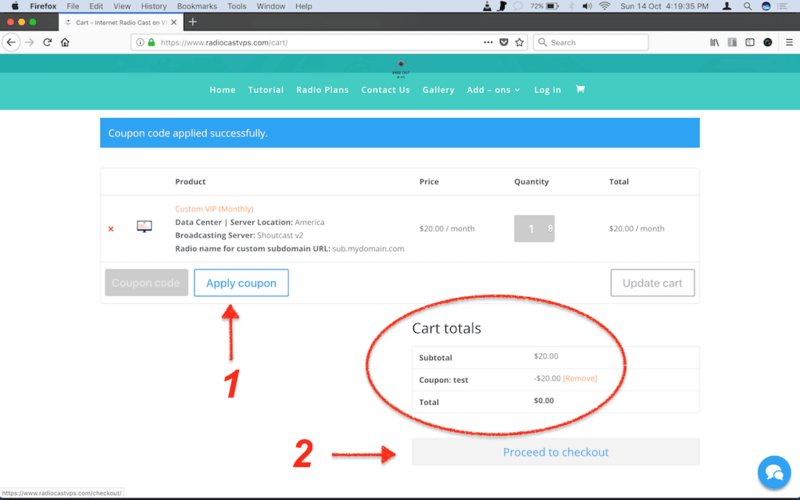 Step three: Add Product to Cart and apply a coupon code if you have one. Then proceed to checkout. Once you have added the plan, you can enter this promo code, OPENING20. It’s a 60% discount for 1 month. That means you only pay $6 for a VIP plan! What’s inside the plan? Well, it’s a 320kbps and unlimited listeners. You get more than what you paid for! Step four: Fill up the required details and then check the box if you agree on our Terms and Condition. After that, Place the order. After placing the order, you will now be redirected to Paypal’s website. Where you can either pay via your PayPal account or pay using your credit card via PayPal gateway. Please be informed that you are not required to create a PayPal account in order to buy using a credit card. Also please take note, that our website is not storing any payment information. All payments are redirected to PayPal for extra safety measures. As of the moment, we don’t accept any other payment gateway other than PayPal. Step five: Lastly, after payment is done, these are the things that you can do. Finally, once you have paid via PayPal. You will be directed to a thank-you page, where you can see a summary of your order. Your account has been created and you are log in automatically. Also, there is a direct link of your complete order overview. You can also check your email, for your newly created account password. The username is the email you have registered. Another email indicating that your order has been processed already. 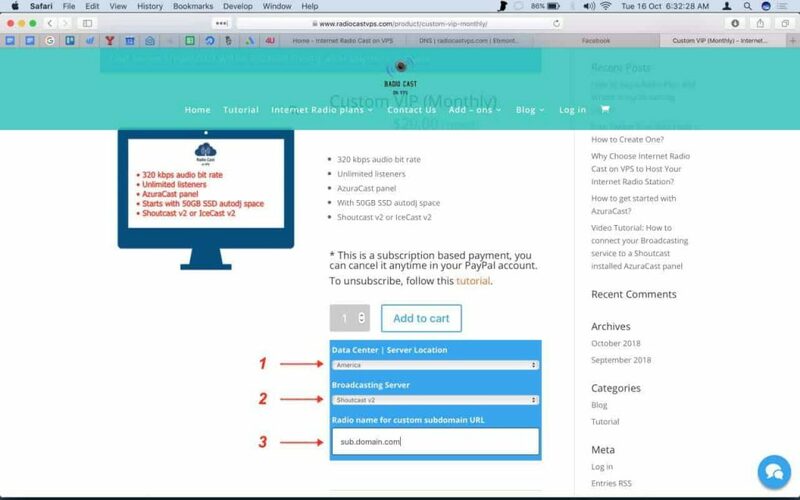 *The direct link of your account will always be, https://www.radiocastvps.com/my-account.But you can login and logout anytime using the primary menu above. In less than 1-3 hours, after your streaming server has been created. Another new email will be emailed to you. This time, with all the informations about your streaming server. Admin password – for your Shoutcast or Icecast admin page. You can also find the same information in your account’s order menu. A view button, indicating your streaming information and login link and the associated order. So if you bought 2 plans, they are separated and organized properly with different login links. Additionally, a PDF invoice of your recent order. You can visit the link anytime and login to your newly created streaming server. (Please check the slider image). In the order menu of the Account dashboard. With an Invoice button and a view button for each specific plan. Inside a specific plan/subscription. All infos needed are there.